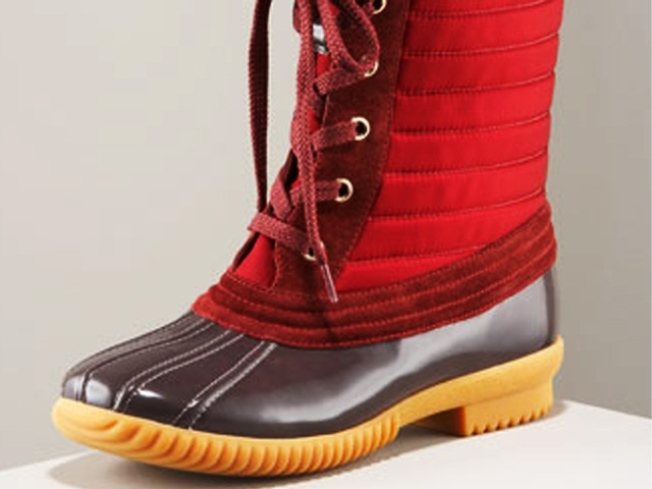 The Marc Jacobs duck boot: not for lobstering. 2.0: With apologies to L.L. Bean, we’re coveting Marc Jacobs’ adaptation of the classic duck boot, made of nylon and (decidedly un-Maine-like) imported Italian suede. $230 at Bergdorf Goodman, 754 Fifth Avenue; 212-753-7300. CLEARANCE: On Sunday night, Otte Brooklyn will close its doors; until then, have at the last of the deals: everything in the store is slashed to $10-$80, including denim from Current/Elliott and Earnest Sewn. (And don’t worry: the chainlet’s downtown Manhattan stores are still going strong.) 132 North 5th Street, Williamsburg, Brooklyn; 718-302-3007. PREEN: It’s not often we get excited about tights, but these black ones printed with a sassy turquoise-and-auburn peacock-feather riding up to the knees could make our fall footwear moot. Look from London tights are $29.99 at ModCloth. SLASH DOT: Spring cleaning is all well and good – but how about fall cleaning? Out with the old, in with the (discounted) new: Through September 8, get 20% off absolutely everything in store at Blu-Dot, part of the mod home outfitter’s annual 20/20 sale. 140 Wooster Street; 212-780-9058. GOING ONCE: It’s the last weekend to mow down your fellow New Yorkers for take advantage of deep discounts at the annual Barneys warehouse sale; the event wraps on Monday night, September 7. 255 West 17th Street; 212-450-8400.